Register Log In Piano World Home Page Forums Piano Forum What grand pianos have emphasis on clarity? I like to hear suggestions for grand piano makes/model that have a greater emphasis on clarity as opposed to power. I was recently listening to a fortepiano and was thinking how much I enjoy the clarity of the voices, esp., in faster, thicker music, and how much I don't like the woodiness of the tenor and above registers. So, I'd love to hear about pianos that tend toward the lighter side (of course not like a fortepiano but not too "big"). Not bright! But clear, esp. in the bass, with an tenor and above that still sings. I'm prob. looking for a used piano, and def. for a grand. I am a intermediate pianist, but have very picky ears. I currently have a 1909 Mason & Hamlin AA, which has had major work done on it (pretty much everything, but kept soundboard because of excellent crown!) I have it in a room which is much too small for it (11x14), and have a constant issue with feeling that there is string noise at higher volume. Have had several fine technicians work on it, and we have improved it...but a lot of that was from damping after the bridges with felt, which I think is costing me resonance. I think it's just too much piano for my space, and am wondering about higher quality alternatives. I've tried soaking up sound with carpet and etc., but it's still too much....I think the sound just doesn't have time to develop in such a small space. For perspective, I've never met a Yamaha I liked. The best piano I ever played was a rebuilt Steinway B out of the same shop that worked on my piano. When my AA was in the shop, ready to come home, I loved it...but that's a very big space. I have the sense that some German makers may be the best bet for me...but used excellent examples are rare here (I am in the San Francisco Bay Area). Clarity and power are not opposites. It sounds like you're looking for a softer piano with clear tone. I think most European pianos have more of an emphasis on the fundamental(and less of the overtones) than American pianos and that is how I see clarity. What do you mean by string noise at higher volume? It's possible that Estonia would be to your liking. I think I've read they tend to be not overly loud and I'm sure others can comment with more experience on that possibility. Not sure where they would rank on a clarity scale. There are other pianos with a clear tone but very few pianos are designed to be soft. I think Del Fandrich designed one specifically to be softer for home use, but I don't remember which company it was for. Difficulty playing softly can be caused by the piano's characteristics/design, the room's acoustics, the piano's regulation, the pianist's technique. or a combination of some of those things. You are hardly in a wasteland for trying European pianos, which as noted above seem to emphasize clarity. Go play; would be very interested to read what you discover. What you are interpretting as string noise is probably just reflections from the walls of your small room. Try 2" acoustic foam to cover your walls and bass traps in the corners for the low end. It made a 100% difference for me. Clarity comes from adding definition to the surface of the hammers, by ironing or lacquer along with careful sanding. IMO one of the pianos that you might give a try is the Schimmel Pianos. I agree with the schimmel recommendation. Used ibach schiedmayer, and bluthner might also be good bets. I would like to come back to the string noise question. What does what it is you are talking about sound like? I thought string noise was what pianos were all about. Please don't take away the string noise! Hi, and thanks for the responses! I hadn't checked in, as I thought I would get an email notification if any one responded.....apologies if I seemed to abandon the thread. Kokatla, I think you may be right. I hope this weekend to strip the room of any potential noisemakers, and then try to isolate the buzz. Then I will try the foam and etc. Well, so hard to describe the string noise! One tech explained it by saying the note was "overdriven". There's like a high-pitched clash of sound immed. upon attack, a sort-of raspy sound, that dissipates. Was most noticeable in G/G#/A a 12th above middle C. It was improved somewhat by damping with felt after the bridges. Like there was too complex a sound coming out for the small space. That's why I think damping might help. I feel weird about having so much of it damped off, because I feel that I lose richness. I don't really have problem playing softly. But at the same time, when you want fff, you don't want to back off...but in my case you want a little less then what a Steinway D would give! It may be difficult to find nowadays, but the German made Seiler has one of the clearest and purest tones I have ever heard in a piano. I played an SE-242 some time ago, and I thought I was in heaven! The tone of the Asian made Seilers are not bad either! Here is a youtube video of Joey Tranvik playing Chopin on an SE-242. Also, the room acoustics affect the perception of sound as well. An instrument that sounds great in a large, reverberant room may not sound great in living rooms, for example. There are fine piano stores in the Bay Area. Make an appointment with Mr.Kassman to try a Steingraeber, or simply go to stores like Piedmont Piano in Oakland, San Mateo Piano for Shigeru Kawais, Music Exchange for Yamahas and Bösendorfers, etc. In a small room, however, it's really critical that the regulation is good, to make it possible to play pianissimo consistently. If Mr Kassman still has stock of Sauter grands you may get one at an excellent price .Great performance grade pianos with marvelous clarity . When I was piano shopping last August, I was stunned by the clarity of the August Förster that I ultimately bought. It was the clarity that separated it from all the other pianos I tried, including 2 Schimmels, 2 Blüthners, several Steinways, several Yahamas, a Seiler, a Baldwin, etc. Försters are very difficult to find in the U.S. If you run across one, try it out. The instruments with the biggest clarity I have ever heard are straigth strung Erard grands from the 19th century. They are dfferent in many aspects from your typical grand piano (shallower key depth for instance) but have a beautiful clear sound. Apart from that they look stunning. Harder to find obviously and not suited to every type of music but definitely good instruments. They are similar enough to modern grands so that they can be maintained by most techs. I would recommend you try a Shigeru Kawai, e.g. SK-2 - clarity and purity come to mind in describing their tone. I often think in terms of complexity vs. purity of tone with clarity being more related to brightness or percussiveness of tone. By changing the attack, you get more tone or clarity, but other factors really determine the note separation in thicker passages. Regardless of the words, pianos that tend to have better note separation in thicker passages display tonal color differently. Some are clear at one dynamic level while complex or "thick" at another. Most of the pianos that stand out to me for maintaining not separation better are European. Bösendorfer excels at this. Grotrian is extremely pure in tone. Seiler exhibits this wonderfully. Many Schimmel models excel at clarity, but some are more pure than others. Fazioli, Steingraeber & Söhne, Blüthner, C.Bechstein...all exceptional clarity, but some more pure than others. Estonia excels at this in the treble, but tends to offer a more complex tenor and bass that I often prefer, but would not say is as clear. Sometimes, I think Estonia's bass sounds more "American" to me. In fact, I cannot think of any well respected American brand that excels in clarity...many offer it beautifully at times, certain registers or at certain dynamic levels, but never across the breadth of the piano's range. I just don't think that is their strength. They have many other qualities, but seemingly by mid-19th century, American designs were developing complexity. These inharmonicities, distortions, and drive for power to serve larger halls became a signature of the most successful brands well into the 20th century. There are exceptions, there are hammer choices that influence the profile, by I feel it's like trying to find a white wine while standing in the red section. Clarity of tone ?What is it we as buyers mean ?The definitions given sound so complex ? For sure we do not want an indefinable buzz ? We want a clear beautiful tone ? So what is that ? 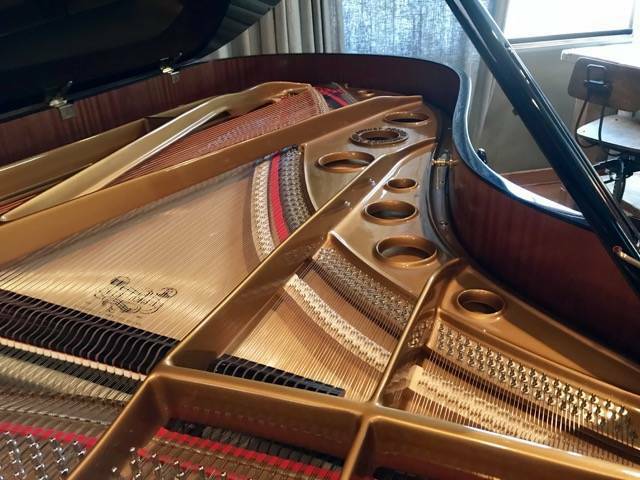 I played a Bösendorfer grand with a lack of clarity .Was it just that particular piano? Is it perhaps that I do not like Bosendorfer tone ? No one wants a percussive brightness unless one only plays Bartok ? White wine or red wine? Well if I do want some wine, I will take red !!! White ??? It gives me headaches ! Thanks, everyone. It's really helpful. The German's come up in almost all posts. And, look whose very noticebly absent - Steinway! Also Mason & Hamlin (which is what I have). As PianoWorksATL said, clarity doesn't seem to be an American strength (pianos, ok, not talking national character!). So, yes, I may go visit Mr. Kassman soon. I'm not really ready to leap.....but then I wasn't looking for a new piano when i found my M&H, either!